What's next for Amazon's healthcare disruption? Although Amazon’s initial foray into the healthcare space is in drug distribution, expansion into medical device/supplies distribution in the near term seems likely. And for good reason: Medical devices and supplies represent more than $117 billion in annual expenditures in the U.S. However, Amazon’s capabilities are relatively limited and the existing medical supply distribution chain is already remarkably efficient. The retail behemoth must address several key gaps and limitations before it can effectively compete with traditional distributors. Amazon’s recent acquisition of the online pharmacy startup PillPack has many wondering whether the ubiquitous online retailer is on the verge of disrupting healthcare. Although its initial foray into the space is in drug distribution, expansion into medical device/supplies distribution in the near term seems likely for the internet giant that’s accustomed to disrupting business as usual. Given Amazon’s user familiarity, deep expertise in distribution, operational scale, existing B2B and B2C platforms, nascent presence in healthcare, and massive reach, it seems only a matter of time before the company further expands in this space and threatens to change the existing medical supplies distribution paradigm to one that centers on ecommerce. No wonder medical supplies distributors are anxious about a more substantial Amazon entry into medical supply distribution. And why wouldn’t Amazon want to more substantially participate in the medical supplies market? Medical devices and supplies represent more than $117 billion in annual expenditures in the U.S., with several major medical supplies distributors capturing a good chunk of this spend (e.g., Cardinal Health’s medical segment reported $13.5 billion in revenues in 2017, Owens & Minor $9.3 billion, Patterson Medical $5.6 billion and Henry Schein $3.3 billion). Already, Amazon has acquired licenses for medical supplies distribution in 43 states and is selling various medical supplies through its Amazon Business platform (see Figures 1, 2). But how far can its reach go, especially in the near term? Are fears about Amazon taking over medical supplies distribution overblown? Although Amazon undoubtedly will ultimately play a significant role in transforming medical supplies distribution, we believe the hype far overshadows the potential near-term impact of Amazon’s entry into the space — primarily because its capabilities are relatively limited and the existing medical supply distribution chain is already remarkably efficient. 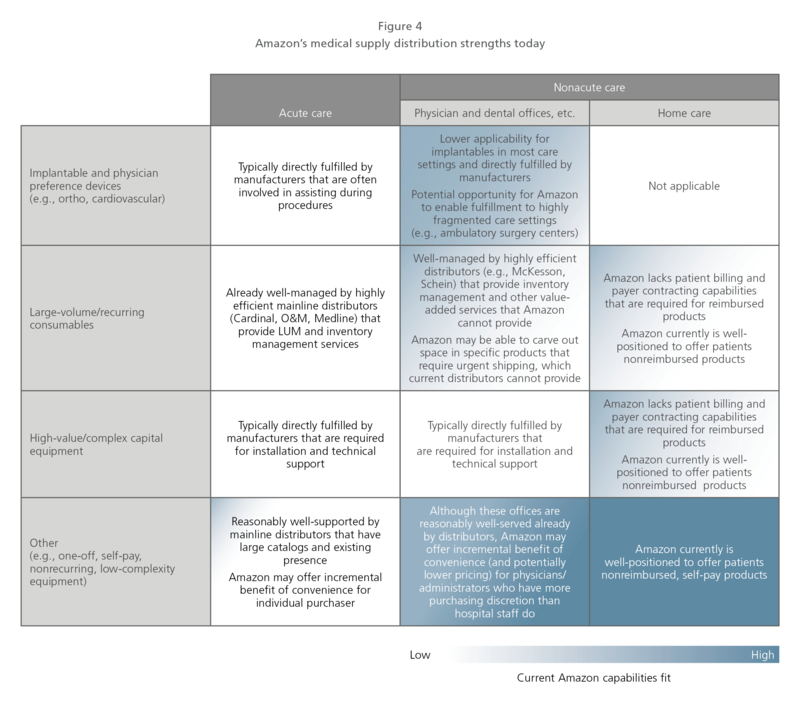 Although the company’s strengths meet a few key criteria for providers (and manufacturers) — such as rapid shipments, broad product coverage, and simple and familiar user interfaces — Amazon’s value proposition in broad-based healthcare distribution (particularly to hospitals) is, to be frank, thin (see Figure 3). Amazon must address several key gaps and limitations before it can effectively compete with traditional medical supplies distributors. Absent the infrastructure to provide high-volume consumable products distributed to hospitals, reimbursable devices and capital equipment, the company is more suited to distributing low-volume, one-off purchases among fragmented care sites with individual decision-makers (e.g., small doctor or dentist offices). That could change if Amazon were to acquire one of the major hospital distributors, such as Owens & Minor, or enhance its capabilities to include bulk shipping, LUM (low unit of measure) and stocking, inventory management, and supply chain advisory services, to name a few. Similarly, until it develops patient billing, payer contracting capabilities and medical claims submission/processing capabilities, it will be unable to distribute reimbursed home-care products. The role of medical supplies distributors extends far beyond order fulfillment and varies significantly across care settings (e.g., hospitals vs. nonacute-care settings). Although Amazon can meet some customer needs across care settings, its current capabilities are insufficient to meet the most critical needs of many customers. Low medical supplies distribution margins (and already high levels of market efficiency) diminish the attractiveness of and rationale for Amazon investment vis-a-vis other potential growth opportunities. 1. The role of medical supplies distributors extends far beyond order fulfillment and varies by care settings (e.g., hospitals vs. nonacute-care settings). Medical supplies distributors fill several roles as the intermediary between manufacturers and healthcare providers across acute-, nonacute- and home-care settings, including order fulfillment, demand creation and influence of product selection, and consulting and advisory services. Healthcare providers value many of the broader services that distributors offer, and Amazon is not currently well-equipped to assume these roles. With respect to order fulfillment, distributors ensure timely and efficient delivery of products, coordinate with the manufacturer to process orders, request drop shipments, and provide services such as LUM, on-site stocking and reordering. With respect to demand creation and product influence, distributors help inform, educate and standardize provider purchasing through distributor sales representatives who can also help manufacturers influence provider purchase decisions via contracting and economic incentives. Finally, with respect to consulting and advisory services, distributors can serve as a central point of contact for billing and payments; assist providers with supply chain, inventory management, and clinical and nonclinical workflow; and even provide on-site supply chain management. Within home care, distributors actually adjudicate patient billing and claims questions directly with payers, saving providers and manufacturers significant time and effort. 2. Although Amazon can meet some customer needs across care settings, its current capabilities are insufficient to meet the most critical needs of many customers. Fundamentally, the true test of Amazon’s ability to disrupt the medical supplies distribution landscape is whether its value proposition will resonate with different segments of the market and drive shifts in how and where customers purchase. Amazon’s value proposition lies in providing a wide variety of products rapidly and easily in low-order volumes, but those benefits are more suited to fragmented and individualized purchasing rather than to centralized procurement departments that are increasingly driving decision-making. Moreover, to be truly effective across care settings, Amazon’s offerings would need to be customized to allow for differences in packaging, delivery frequency, etc. Although Amazon is well-positioned today with respect to certain product areas and channels (see Figure 4), the majority of care settings and product types do not fit well with Amazon’s value proposition. Specifically, acute-care settings, where the bulk of medical supplies are purchased today, require incredibly high service levels, the ability to order in bulk and private-label products to drive savings. They also expect a variety of services that many distributors offer, ranging from inventory management to kitting to address their complex and specific needs. In contrast, nonacute-care settings, such as physician and dental offices, as well as home care, may find benefits in Amazon’s value proposition, though typically for lower-margin one-off products (e.g., crutches, unspecialized braces). 3. Low medical supplies distribution margins (and already high levels of market efficiency) diminish the attractiveness of and rationale for Amazon investment vis-a-vis other potential growth opportunities. Finally, assuming Amazon invests significantly in filling its capability gaps (e.g., begins to offer distribution-related services for hospitals, home-care contracts with payers, patient billing capabilities and strategic collaborations with manufacturers on how to deal with pricing issues), the question remains: Is medical supplies distribution an attractive market for the retail giant? While medical supplies distributors enjoy significant revenues, their margins tell another story. In fact, pure-play distributors (those that do not have a significant private-label presence) have seen their margins decline steadily over the past 10 years (see Figure 5). These low and declining margins are the primary reason all the major medical distributors are expanding their higher-margin, private-label/branded product portfolios. Medline, a highly successful manufacturer and distributor of medical supplies, has long leveraged its distribution business to carry its higher-margin private-label products. Simply stated, pure medical supplies distribution services are largely commoditized and alone may not appear attractive enough to justify significant entry. 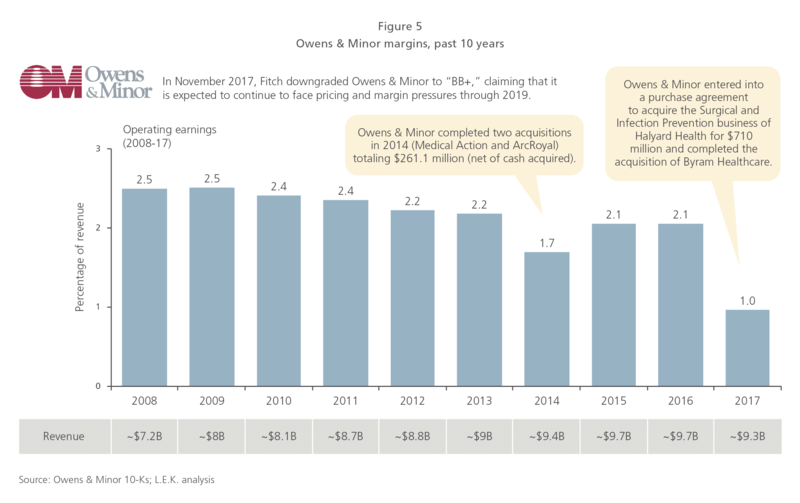 Although as noted, Amazon could acquire a company like Owens & Minor to instantly position itself as a medical supplies distribution leader, but it is hard to see why it would want to do so. 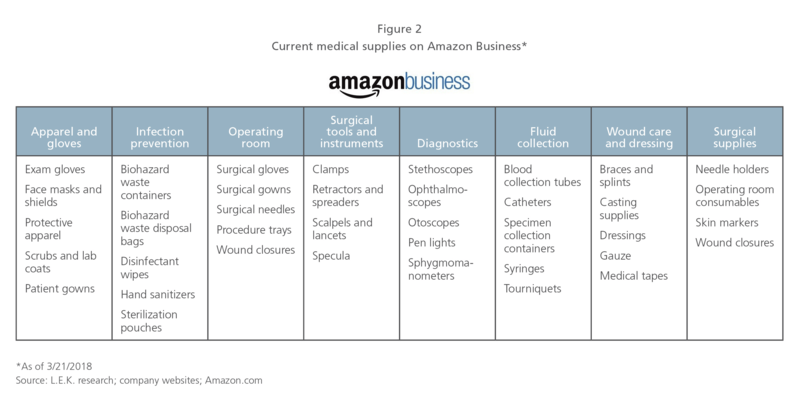 Moreover, although Amazon can build and/or buy capabilities to expand its footprint in medical supplies distribution, some of these changes (i.e., bulk shipping, inventory management and standardized decision-making) are big departures from what has made Amazon successful today, which suggests a medical supplies distribution arm would have relatively low synergy with the company’s existing business and capabilities (though that has never stopped Amazon before). So, can you buy your critical-care hospital products tomorrow on Amazon Prime? Probably not. But given Amazon’s seemingly limitless wealth and interest in solving big, complex problems, we should eventually expect Amazon to grow its capabilities to become a more serious player in distributing medical supplies — assuming it wants to. Until then, there might be ways for those in the medtech space to leverage today’s Amazon to sell and expand their reach into fragmented, nonacute-care settings, particularly for companies/products with a low share currently, and/or to provide leverage against mainline distributors that may be competing with private-label products. 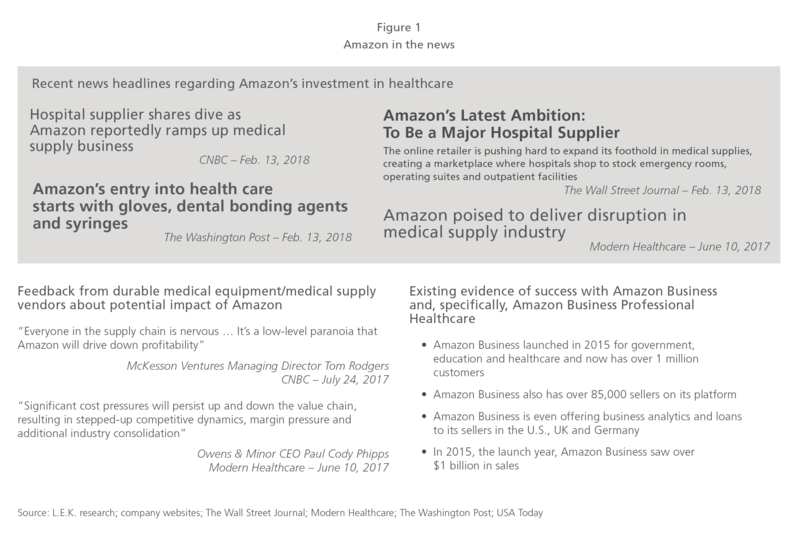 In short, we expect Amazon to continue to gradually expand into medical supplies distribution but to do so in more limited segments. At least for the time being, its capabilities and apparent focus, based on the PillPack acquisition, seem to be in other parts of healthcare, namely pharmacy/drug distribution. Our ninth annual Hospital Study explores what hospitals are facing from a change perspective and the implications for medtechs and other suppliers.